Yesterday, zem got a new pet @ Target. I told her she didn’t even play with mr.zhuzhu anymore and she said it was because he needed a new friend. She sacrificed her marshmallows, so I bought her the white one. 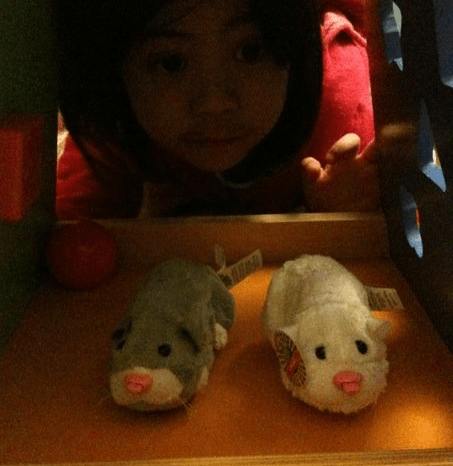 She spent last night playing with her pet hamsters, with her newest addition, Miss ZhiZhi. Miss ZhiZhi likes pushing Mr.ZhuZhu around, a trait I find Mr.ZhuZhu needs to dismiss if he ever wants to marry Miss ZhiZhi. Maybe for Valentine’s day, we can get Mr.ZhuZhu some well needed pants, because so far, we know who’s wearing them. You can usually tell in couples, who’s wearing them.